Why is “The Steerage” hailed “one of the greatest photographs of all time”? I just don't get it. It is a document for sure, but why is it so important? I don't have art background so I'm not sure what "artistic modernism" even is ("artistic modernism" image search yields pictures that are very different in style). I can see how it's a reasonably good photograph, but I have no clue why do people say it's "one of the greatest photographs of all time". I also feel the same when seeing photographs in art galleries. What's the deal? What am I missing? 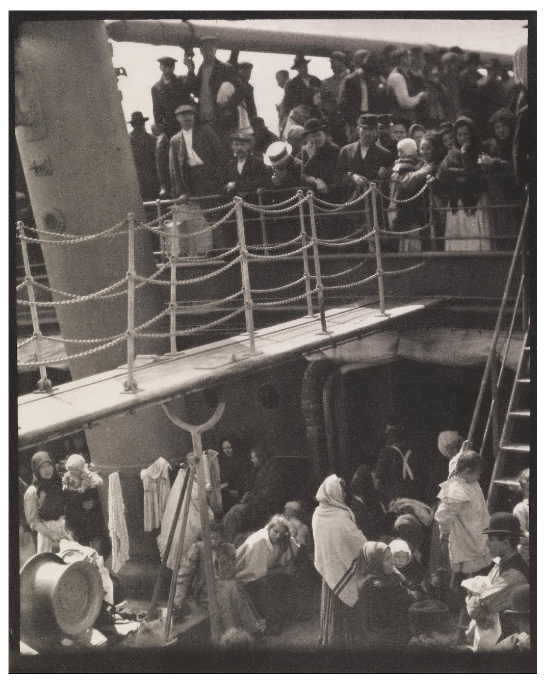 Stieglitz and his photo, "The Steerage" are hailed as great not because of its compositional excellence (at least one aspect of the composition is brilliant, and some of the lines in the frame can be seen as a kind of "proto-Cubism"¹) or the technical merits of the photo. "The Steerage" is most significant because it was one of the first times a photograph was used to say something about human society with artistic intent while also presenting the scene as realistically as possible instead of either a) merely documenting it largely without comment or artistic intent or b) modifying it significantly to shape a possible message or artistic intent. The way Stieglitz captured the photo was starkly different from the way those recognized by the art community as the highest practitioners of photography as art at that time were doing things. Those few artistic photographers who "had something to say" in 1907 typically used the pictorialist style that used various methods to alter the realism of the scene to fit their message. Stieglitz himself was a pictorialist at the time, and only published The Steerage in 1911 over four years after taking the photo as he began moving away from pictorialism. Rather than attempting to sugar coat things and make them look as romantically appealing as was the case with pictorialism, Stieglitz attempted (and succeeded with The Steerage) to show things as realistically as possible. To make an emotional impact, Stieglitz depended on the viewer seeing the contents of the scene as they were and understanding some of the underlying factors that led to the scene appearing the way it did while at the same time recognizing some of the more abstract artistic elements of the scene and their significance. The compositional stroke of genius was the way Steiglitz found an angle that placed the empty and immaculate gangway (unused for the entire voyage, according to Stieglitz) leading to first class off camera as an apparently impenetrable barrier between those pictured in steerage on the right and below and those (not pictured) in first class luxury to the left of and behind the camera. The strong geometric lines of the gangway, the mast, the boom, the deck girder, the entrance to the hold, and the steep staircase to the left serve to confine those in steerage. So although the photo itself was an unaltered view of reality, the elements of that reality and the way Steiglitz managed to place them in the frame had great metaphorical and symbolic significance from an artistic point of view. Those that break new ground and create a way of communicating that has never been done before. These are the "first of their kind" types of masterpieces. Those that build on the former and reach an absolute pinnacle of a particular style that perfects it in such a way that after which there's nowhere higher for anyone else to go. It is very rare for the same artist, much less the same work, to do both. Perhaps the best example that comes to mind is Earl Scruggs' 'three finger style' of playing the banjo that never existed before he developed it, and has never been topped by anyone after him. In contrast, when Michelangelo sculpted David he achieved the highest expression of Renaissance sculpture that had been developing for centuries and reached all the way back to classical Greek forms for its origins. As Giorgio Vasari said about David, it surpassed "all ancient and modern statues, whether Greek or Latin, that have ever existed." After David, there was nothing left to do but find a different direction in which to go regarding marble sculpture. Thus the development of Mannerism, which favored compositional tension and instability rather than the proportion, balance, and ideal beauty of the High Renaissance. Stieglitz's The Steerage is the first type. With it he introduced a new way of using photographs that were starkly realistic yet managed, through their carefully composed realism, to say things in a symbolic and metaphorical way using artistic vocabulary. There are far better examples, in terms of composition and technical prowess, of what Stieglitz started with The Steerage. Some of the works of Weston, Adams, and Lange come to mind. But there are not many, if any, earlier examples. There were others before Stieglitz and The Steerage who used photographs to "tell stories". Jacob Riis², who is perhaps a "grandfather" of modern photojournalism,³ was doing that as early as the 1880s. Mathew Brady, who documented the American Civil War in the early 1860s might be seen as one of the "great grandfathers" of photojournalism. But Brady and Riis had no aspirations for their photos to be seen as "Art". Stieglitz, on the other hand, started with artistic intent and discovered he could frame a "documentary" photo so that it demonstrated desired artistic elements. Stieglitz' The Steerage was revolutionary in that it was an early form of "Proto-Cubism" at the same time that Picasso was first experimenting with it using more traditional mediums, yet Stieglitz did it via the form of a realistic photo - which had never really been used to create high art before. ¹ After having seen The Steerage, Pablo Picasso himself remarked, "This photographer is working in the same spirit as I am." ² Thanks to user BobT for reminding me of Riis. ³ Whether rightly or not, Henri Cartier-Bresson is held by many as the "father" of modern photojournalism. To me, it this picture is a masterpiece because its author basically invented the concept of "telling a story with a photo", while working with a fairly new technology. As (relatively) inexpensive camera were only emerging, (The brownie got out in 1900, and the 35mm film was introduced in 1905), taking this image in 1907 is like creating a great vlog (good production, great pacing, etc.) in 2008 (2 years after Google buys Youtube). It's kind of a big deal... even if by 2019 standards, said vlog is only "ok". Note : Thanks to BobT for pointing out that the picture itself was taken by a 4x5 on a glass plate negative, not 35mm. I mentioned 35mm in the previous paragraph to emphasise the very recent emergence of popular photography. 35mm was basically the "mirrorless" in 1907 ;-) Many pros must still have been using plate cameras. This question makes me think about the movie Citizen Kane. I don't personally like this motion picture, but I can understand how the photography (new angles and patterns), narrative techniques and social commentary are seen as wonders by many experts. Welles INVENTED so many new ways to film and trigger emotions for this movie, that the art itself, moved forward. To answer your question, I think this picture, in 1907, advanced the art of photography. After this picture, photography was less technical, and a more concrete art-form. It seems Stieglitz was an artist that wanted to tell real stories about real people and places... and he liked his medium so much, he, himself became part of the history of photography. Also, I found this on modernism... thanks for making me check seek it out. Roughly, a great metaphor, the rich at the top in the fresh air, the poor below, in the darkness. Not the answer you're looking for? Browse other questions tagged history art or ask your own question. Can one make good photographs with artistic sense but little real technical skill? What was the “New York School” of photography? Why do people say they like “art” and “photography”, instead of just “art”? Why do the people in this old photo look so… photoshopped? Why are the Becher typologies considered artistically valuable?